Ukrainian President Viktor Yanukovych's party claimed victory Sunday in a parliamentary vote tainted by the jailing of the country's top opposition leader. Despite a strong showing of pro-Western opposition parties in the proportional portion of the vote, Yanukovych's Party of Regions was likely to retain its parliamentary majority as its candidates were expected to take the lead in individual races across the country. With former Premier Yulia Tymoshenko in jail and widespread fears of election fraud, the West is paying close attention to the vote in the strategic ex-Soviet state, which lies between Russia and the European Union, and serves as a key conduit for transit of Russian energy supplies to many EU countries. An election deemed undemocratic by international observers could freeze Kiev's ties with the West and push Ukraine toward Moscow. An exit poll conducted by three leading polling agencies showed the Party of Regions ahead with some 28.1 percent of the vote. Tymoshenko's Fatherland party is poised to get about 25 percent of the proportional vote, while the Udar (Punch) led by world boxing champion Vitali Klitschko is set to get around 15 percent, according to the survey. The anti-government nationalist Svoboda (Freedom) party and the Communists, Yanukovych's traditional allies, both look set to get about 12 percent. And even though the three opposition parties have more proportional votes than the Regions and the Communists combined, Yanukovych candidates are likely to win enough individual races to form a majority in parliament. Official results were slow to trickle in. With the votes at less than 1 percent of all polling stations counted, Yanukovych's Party got 50 percent, Tymoshenko's and Klitschko's parties got about 15 percent each, Svoboda got 7 percent and the Communists 5 percent, according to election officials. "We believe that this is an undisputable victory of the Party of Regions," Prime Minister Mykola Azarov said shortly after polls closed. "Above all, it shows the people's trust to the (policy) course that is being pursued." Opposition parties alleged widespread violations on election day, such as vote-buying and multiple voting and an attack on a candidate who tried to document election violations. The Committee of Ukrainian Voters, an independent local election monitor, confirmed those problems, but said it remains to be seen whether the violations would significantly affect the overall elections results and how fair the vote-tallying will be. Authorities insisted the election was honest and democratic. Independent monitors will give their assessment Monday. With Yanukovych under fire over the jailing of his top rival, Tymoshenko; rampant corruption and slow reforms, the opposition made a strong showing. "This clearly shows that the people of Ukraine support the opposition, not for the government," Tymoshenko ally Arseniy Yatsenyuk said. Opposition forces hope to garner enough parliament seats to weaken Yanukovych's power and undo the damage they say he has done: the jailing of Tymoshenko and her top allies, the concentration of power in the hands of the president, the snubbing of the Ukrainian language in favor of Russian, waning media freedoms, a deteriorating business climate and growing corruption. The strong showing by the far-right Svoboda party, which campaigns for the defense of the Ukrainian language and culture but is also infamous for xenophobic and anti-Semitic rhetoric, emerged as a surprise and showed the widespread disappointment and anger with the ruling party. 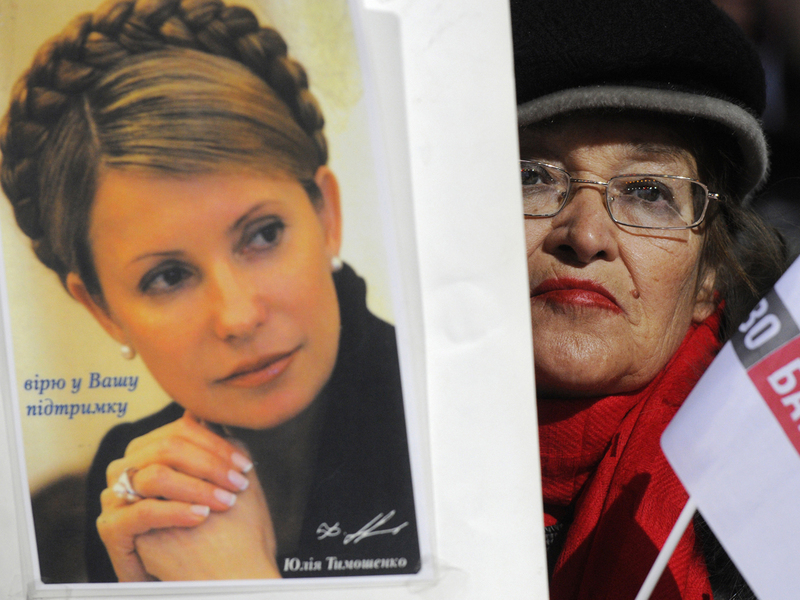 It remains to be seen whether Tymoshenko's group, Klitschko's party and Svoboda can forge a strong alliance and challenge Yanukovych. The election tainted by Tymoshenko's jailing on charges of abuse of office has also been compromised by the creation of fake opposition parties, campaigns by politically unskilled celebrities, and the use of state resources and greater access to television by Yanukovych's party.